Browse similar Snowboard Accessories by Burton, clearance Burton Snowboard Accessories, or click here for all Snowboard Luggage. 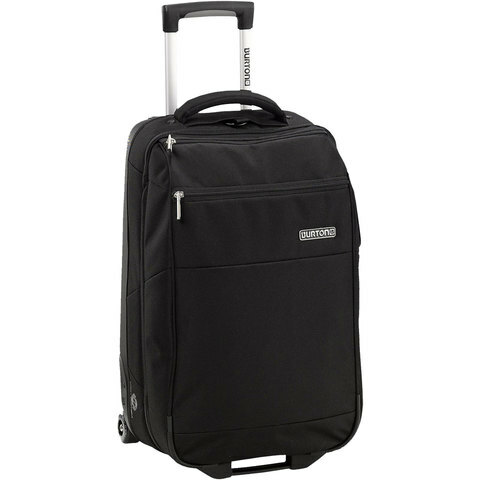 Burton's Wheelie Flight Deck is the roomiest carry on luggage you will find anywhere. If you want to pack a good amount of stuff, without risking lost baggage, the Flight Deck is the bag of choice. Stretchy CRAM™ zippers allow you to completely stuff the bag, and the luggage is also durable to protect your possessions. Lightweight and smoothly-rolling wheels keep the weight off of your shoulders, and the bag also has an external SnakeStack™ attachment for backpacks or other luggage. If a wheel should break (not that it will) they are easily interchangeable to prevent the need to replace the entire bag.